This National Trust Ickworth Summerhouse really caught the eye of our customer, and we can see why now that it sits in their garden, as it suits it to a tee and gives them a focal point to sit and relax in while their grandchildren play in the garden. 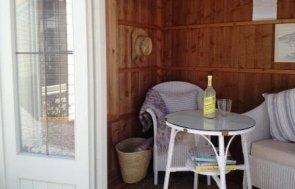 Situated not too far from Birmingham city centre, this garden provides a welcome, relaxing space away from the hustle and bustle of the city, and this summerhouse will give them the opportunity to enjoy it even more. The Ickworth has got a slight roof overhang at the front, which will provide some shade and protection for the front of the summerhouse, and with the double doors and two opening windows on both sides, there will be ample air flow through the garden building. 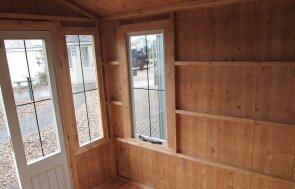 At 3.0 x 2.4m in size, the customer will have enough room inside to make the summerhouse a comfortable and relaxing space, and with the expanse of grass around the building, they will be able to sit outside and enjoy the sun as well. The National Trust range of garden buildings is very traditional in style and offers our customers a step back in time in terms of the design. There are features in the range that have been taken from outbuildings from National Trust properties from around 50 plus years ago; however all of the techniques used to create these features are modern to ensure the quality stays a very high standard. The traditional features include the corrugated roofing material, the cast iron door furniture in the fleur de lis style and the vertical sawn cladding boards. There are eight buildings in the National Trust range in total, four summerhouses and four garden sheds, all with different styles and designs to cater for different purposes and different sized gardens. If you would like one of our National Trust summerhouses or garden sheds, you can use our Online Garden Building Planner Tool to configure and purchase one online, or you can contact us or call us on 01760 444229 to speak to one of our helpful team.